Kamala Kaul Nehru (1 August 1899 – 28 February 1936) was a freedom fighter and the wife of Jawaharlal Nehru (the leader of the Indian National Congress and later the first Prime Minister of India). Her daughter Indira also served later as prime minister of India. 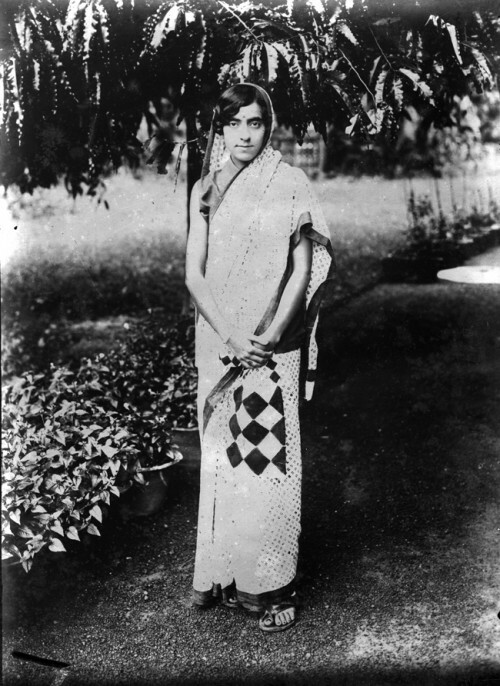 Kamala was involved with the Nehrus in the national movement, that she emerged into the forefront. In the Non Cooperation movement of 1921, she organized groups of women in Allahabad and picketed shops selling foreign cloth and liquor. When her husband was arrested to prevent him delivering a "seditious" public speech, she went in his place to read it out. The British soon realized the threat that Kamala Nehru posed to them and how popular she had become with women's groups all over India. She was thus arrested on two occasions for involvement in Independence struggle activities, along with Sarojini Naidu, Nehru's mother and other women of the Indian freedom struggle. During this period she started a dispensary in her house Swaraj Bhawan, converting few rooms into a Congress Dispensary to treat wounded freedom fighters, their families, and other residents of Allahabad. After her death, Mahatma Gandhi with the help of other prominent leaders, converted this dispensary into a proper hospital known as Kamla Nehru Memorial Hospital in her memory. This article uses material from the Wikipedia article "Kamala Nehru", which is released under the Creative Commons Attribution-Share-Alike License 3.0.